The keyboard contains a group of keys that correspond to characters and functions; the latter are represented by pictograms. Key used to cancel a current operation or to exit a given situation. Key used to launch e-mail software automatically. Solid or soft accessory attached to the bottom of the keyboard; it is used for resting the wrists while typing. Keys that control the main operations of an Internet browser (previous page, next page, stop, search, start). 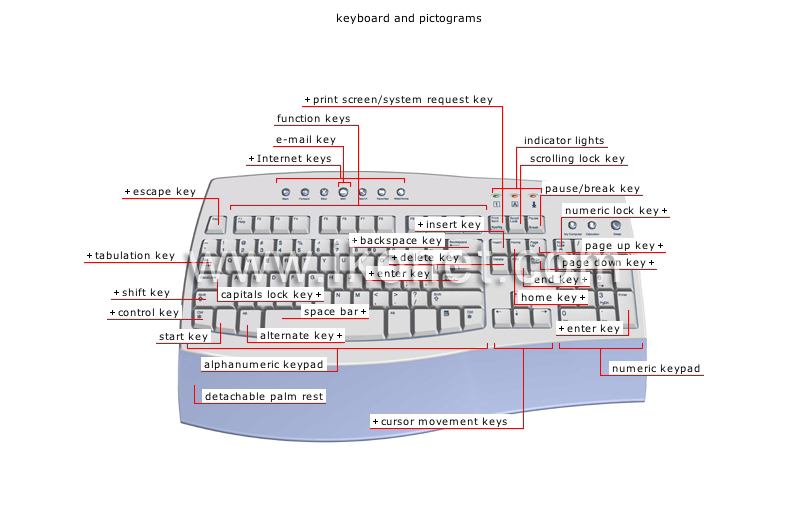 Keys that control various programmed operations; they vary depending on the software used. Key that produces the capital corresponding to a letter or the second character assigned to the key. Key that is used in combination with another key to execute a command on the keyboard without having to scroll down the menu. Key that is used in combination with another key to produce a character or to execute the function assigned to it. Key that inserts a blank space between two words or characters. Key that activates or deactivates the continuous keying of capital letters. Key that moves the cursor to the field or tab stop following or preceding it. Key activating the Start menu (found only on Windows® operating systems). Signal lights indicating activation of the capitals lock, numeric lock and scroll lock functions. Key that activates or deactivates the numeric keypad. Key that displays the next page screen. Key that activates or deactivates the overwrite mode; this allows existing characters to be replaced by new characters during data entry. Key that moves the cursor to the end of a line or a document. Key used to delete a selected item or the character immediately to the right of the cursor. Key used to display the preceding page screen. Key that moves the cursor to the beginning of a line or a document. Key used to print a copy of the data displayed on the screen or, along with other keys, to unlock the system. Key used to pause or stop the current operation. Key used to activate or deactivate scroll mode; this allows the contents of a window to be moved horizontally and vertically using the arrow keys. Keys corresponding to numbers, mathematical operators and functions that are placed in a specific order to speed up numeric data entry. Key used to confirm the execution of a command or, in the case of data entry, to move the cursor to the beginning of the next line. Key used to delete the character immediately to the left of the cursor.